"Noam Chomsky; the most important intellectual alive" is taken from a 1979 remark made in the New York Times Book Review section. The mural omits the word arguably in the quote. 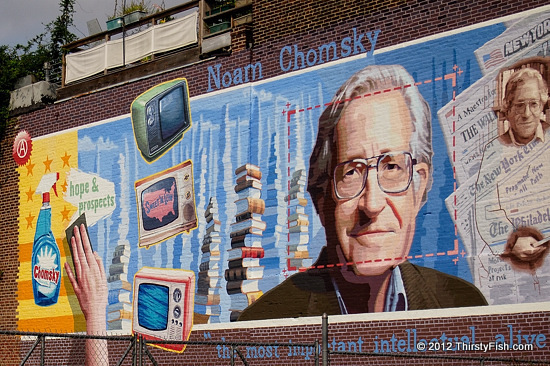 Noam Chomsky is a native of Philadelphia. He is a distinguished linguist, a philosopher, cognitive scientist, historian, and activist. I first took notice of Chomsky for his work on "syntactic structures" as they relate to computer science. Chomsky is a leading dissident intellectual who is admired by a few, and hated or dismissed by many. A significant amount of criticism against Chomsky is through ad hominem attacks or out of context quotes. That itself is an indicator of the power of his knowledge and his ideas. He is hard to dismiss. An all too common theme in history is the marginalization of intellectuals. True intellectuals are attacked, misquoted, ridiculed and ignored, while uninformed propagandist pundits are presented as intelligentsia. These so called mainstream intellectuals generally use clever arguments that appeal to emotion to forward the agendas of their employers. And for the most part, it works - that is until they bring the empire down. True intellectuals have always been a rare breed who do not get much exposure. Noam Chomsky is one such true intellectual. We have a tendency to attach virtues and vices to individuals rather than to acts. Although thinking in terms of people rather than acts simplifies things for us, it could also have serious consequences. There is no one person whose every act is wise, as there is no one whose every action is evil. Wisdom is not absolute. When we canonize people, we run the risk of surrendering critical thinking. Without critical thinking, there can not be any healthy dose of dissent. And without dissent we may end up with a trivial understanding of problems and as a result, with unsuitable solutions. Relegating problems we are capable of solving on our own to wisemen, self-censoring of our own dissent, and as a society, suppressing dissidents, all have historically predictable consequences.